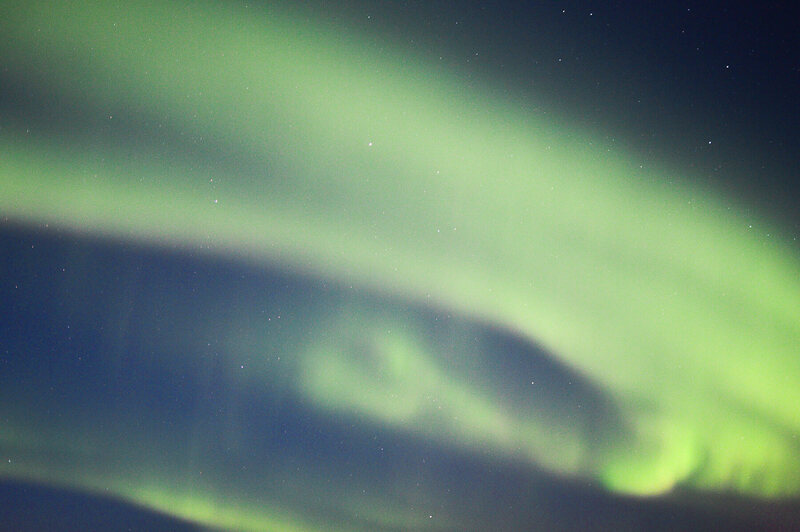 As most of you will probably know by now, the Northern Lights are my most treasured memory. To be completely honest, I don’t know how anything can possibly top this experience (in travel terms anyway), as Mother Nature really did show me something like no other. I experienced the completely breathtaking display of magic when on my trip to Iceland in late September – but since I’ve already spoken about how to photograph them, now I’m going to tell you exactly how, when and where you need to go in order to capture the beauty for yourself. 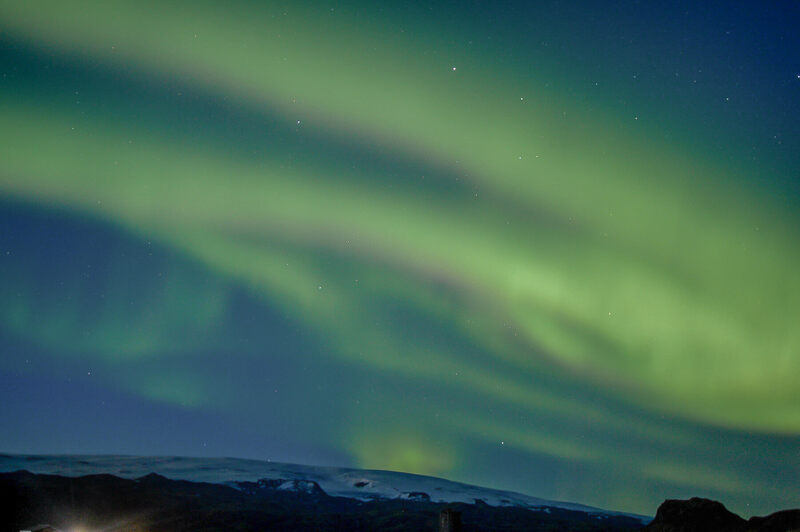 Which is the best country to see the Northern Lights? What is the best time of year to experience them? Where should you go to view the Aurora? When should you venture out? How long do they appear for? I’m sure it’s no surprise to you that the Northern Lights (aka. the Aurora Borealis) is a beautiful display of green light that dances its way across the darkness of the night sky. It’s only when you get to experience the magical show for yourself, that you’ll realise the sheer power of nature and how beautiful the world really is. For those who are unaware of what actually causes this display… It’s created by a collision between electrically charged particles released from the sun; when they collide with the gases in our earth’s atmosphere, an incredible stream of green light is shown across the sky. Pretty nuts, huh? Nature is a crazy, crazy thing. As the name suggests, the Northern Lights stretch across the Earth’s northern polar regions. 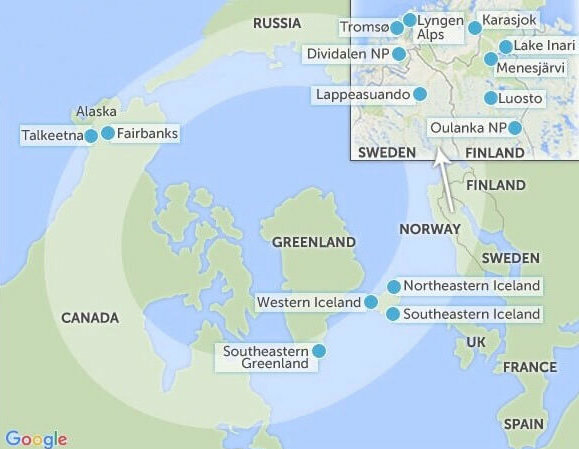 In particular, the ‘Aurora Zone’ extends in a circular shape around the North Pole, and over the top of a vast amount of amazing holiday destinations. Specifically in Iceland, Lapland, Northern Canada and Alaska. As well as Sweden, Greenland, Norway and Finland. AKA – The naturally beautiful, untouched countries that you all need to visit!!!! The most popular places to see the Aurora are definitely Tromso – Norway (check out this post for more tips on seeing the Northern Lights in Tromso) Iceland, Svalbard – Norway and Fairbanks – Alaska. There have been times were cities out of the Aurora Zones have seen the lights, but it’s often a very rare occurrence. During the period when I was in Iceland, it was seen in England and Scotland – which isn’t something that they’re treated too very regularly! 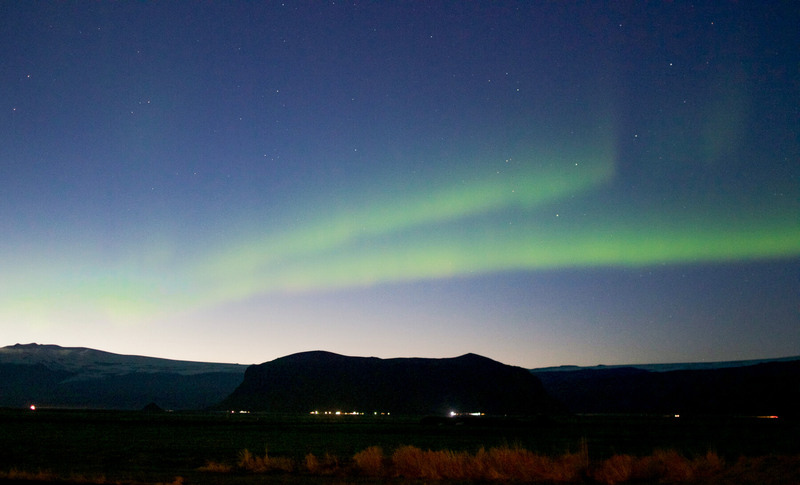 It is recommended to plan a trip to see the Aurora anywhere between December and April. But obviously, that isn’t always a guarantee, nor is it very accurate. Basically, the Northern Lights only appear when the sky is dark and the sky is clear, so if you plan on trying to spot the lights during the midnight sun… you may not have the best chance! In my opinion, I would say the earliest is late September and the latest is mid-April. I know it’s such a huge gap, but there’s really no telling when they’re going to appear. People have been known to spend years and years trying to chase the lights, so unfortunately, the experience is really based on good luck! If you have the opportunity to step away from the city, that’s where the magic really comes to life. Light pollution can drastically affect your ability to see the Aurora in the sky. So unless it’s an incredibly active period like what I was lucky enough to experience, they’re very rarely spotted in the major cities. So, the further away you can get from the big towns, the brighter the sky will be! Spending a night or two in a quiet area is also a great idea; as this means less light pollution, and a much higher chance of even seeing the magic. Even if you have the ability to sleep in your car for a night, it could potentially be the most unforgettable night of your life! From my knowledge, this entirely depends on exactly where you are in the world, so I guess I can only tell you from my personal experience. But I do know one thing – it must be very very dark! During the first couple of days of my Northern Lights trip, we were checking the sky every few minutes; hoping that any second the sky would turn green. And although it often seemed as though there was no chance of them appearing, I learnt one very valuable thing… Don’t quit too early! Each of the 5 displays I encountered emerged at around 10 pm – almost an hour after the sun had set – (but remember this was in September – Iceland has some very strange sunset times during other parts of the year). And believe it or not, the Aurora really does come out of nowhere; one second the sky will be pitch black, and the next there will be a vibrant stream of green and purple light violently dancing above you. So although it seems as if there is no hope, don’t ever be discouraged! We were lucky enough to have perfectly clear skies throughout all but one of our nights in the country, so the Aurora was visible to the eye quite quickly. If you’re sadly attempting to experience the lights during a cloudy night, they may be a little more difficult to find. You could potentially have to wait until the early hours of the morning for the cloud to clear before you’ll know that they’re even there. 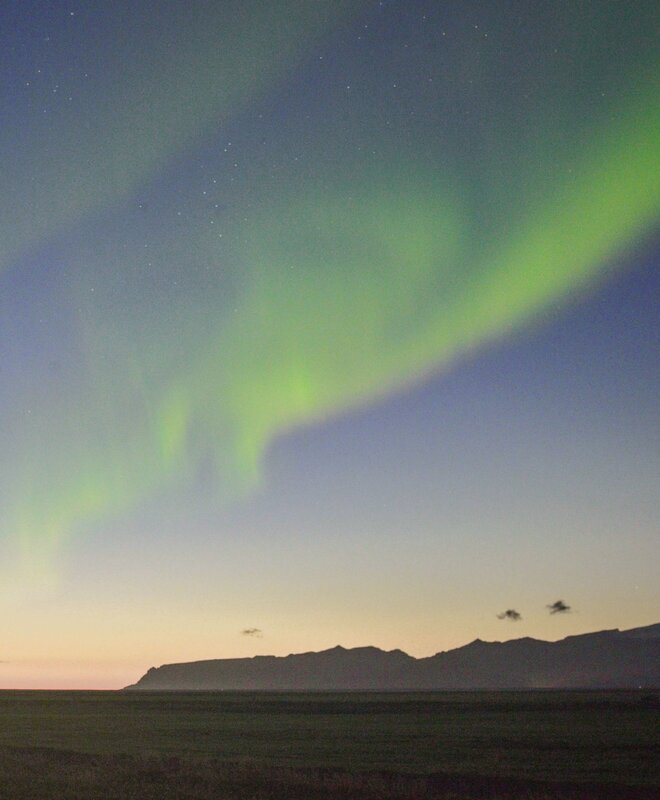 TIP ➤ If you’re travelling to Iceland to experience the magic, make sure to check out the Iceland Aurora Forecast. 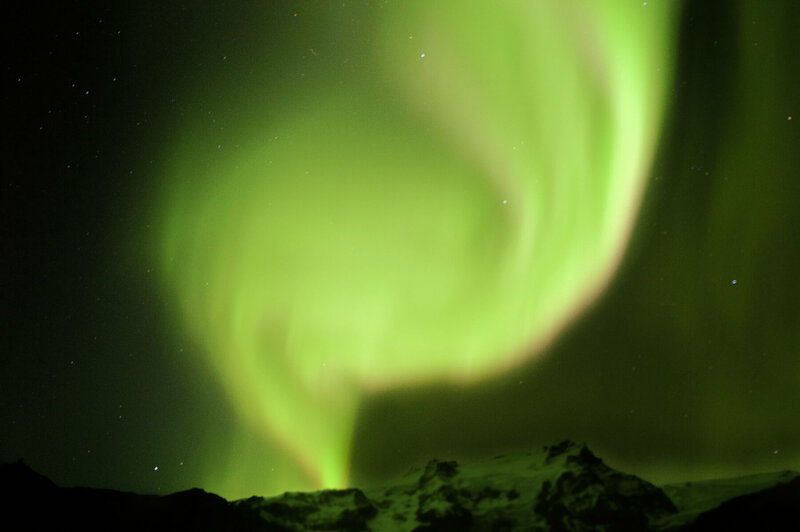 This website gives a full forecast of cloud coverage across the country, as well as the chance you’re going to have of seeing the Northen Lights before stepping out into the often debilitating weather! The active periods can last for up to 30 minutes! They will often continue to fade away and return on repeat for a good few hours, but it once again depends on the weather conditions. They may last for only a few seconds, or they may dance in the sky for hours on end! Believe me, you need to be prepared! Warm under layers – here is a list of the best wool clothes that will be perfect for those frosty Iceland nights! Lots of time. You really don’t want to be in a rush! The Aurora Borealis is the most phenomenal natural wonder that your eyes will ever see. I deeply encourage every single one of you to try and experience the beauty for yourself. You certainly won’t regret it. seriously can not wait to see the northern lights in Iceland in two weeks <3 thank you for this post! 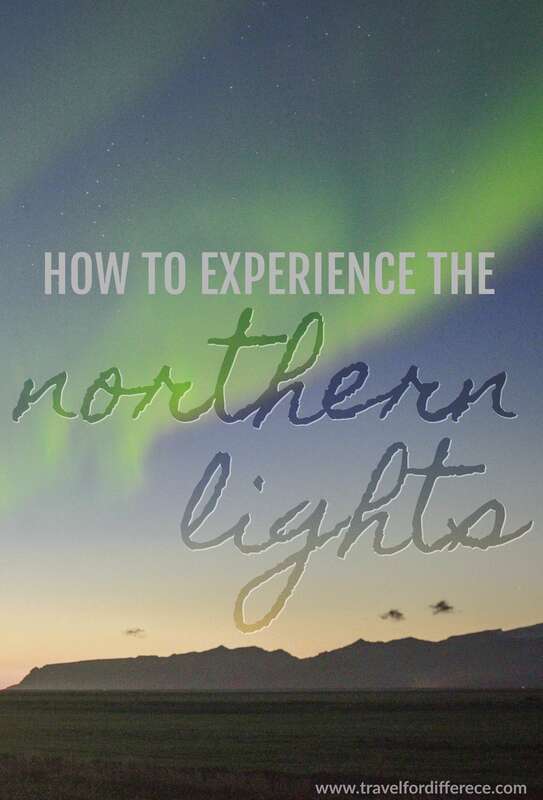 Great tips you have here, I must book a trip somewhere to experience the northern lights! I am one of the fortunate few that have seen the Northern lights but from my home country of Scotland, however I know so many people (myself included) who travelled to Iceland for the Northern lights and had no luck! That’s what makes them so special, they’re not guaranteed! Guides like this are so so useful however, as I’d no idea there was tweaks such as time of year and night that help see them – I naively always thought it was up to mother nature as and when she pleased. That’s incredible Lauren – it must have been such an amazing experience to see them all the way in Scotland! And yes you’re absolutely right, I coincidently visited during a super active period and it was so incredible; I felt very very lucky to have experienced it. I’m so glad you found this guide useful, but you certainly weren’t naive because mother nature really does let them appear whenever it suits best! The time frames are definitely when they frequently appear, but you never truly know! !